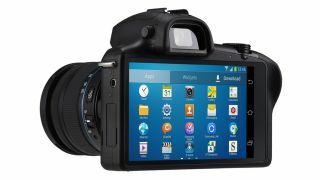 Samsung has launched the world's first compact system camera to feature 4G and the Android operating system. The Samsung Galaxy NX is designed to combine the high image quality of the interchangeable lens camera with the ease of use and versatility of Android navigation. The camera is the latest in the Samsung Galaxy range of cameras and smartphones. Last year, Samsung introduced the Samsung Galaxy Camera, a compact camera that has proven popular with both consumers and critics. It recently also announced the Samsung Galaxy S4 Zoom, a hybrid phone/compact camera with unusual looks. Featuring a 20.3 million-pixel APS-C sized sensor, the Galaxy NX joins Samsung's established range of NX compact system cameras. Also onboard is a Drime IV Image Signal Processor, which is promised to deliver speed and accuracy. Samsung's NX range also includes a number of different interchangeable lenses, such as compact 'pancake' lenses, an ultra-wide fisheye lens and high quality prime and zoom lenses. Android 4.2 Jelly Bean is incorporated into the camera, along with Wi-Fi, GPS and 3G and 4G connectivity. This means that you can choose from the huge range of Android-powered apps, such as Instagram, Facebook and Twitter, to help personalise the device. More than 30 Smart Mode options are designed to choose the most appropriate settings for the shooting environment, while a range of fun features are also included, such as Multi Exposure and Animated Photo. The Samsung Galaxy NX price is not yet confirmed, but it is expected to be available in shops this summer.